These bristle hair brushes are used for bold, sweeping strokes, or on edge for fine lines. 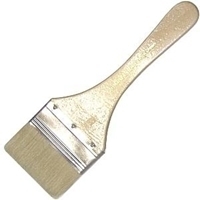 It is primarily used for scholastic grade brushes, but often blended with other hairs for inexpensive watercolor and touch-up brushes. With the most economical and competitive prices and best quality, our paint brush set promises to aid in completion of your art project with minimum hassle. With excellent quality, these brushes make great use in professional painting. These brushes are perfect for bulk buying since they are extremely economical. We offer best prices for art supplies to ensure your creative side never has to compromise on quality.